This little hidden gem, created by ALAN WOO AND DAVIS NGO, is located only a couple blocks from the bustling St. Mark’s area of NYC in the East Village. It features a new spin on the classic Vietnamese sandwich called the Bánh mì. It is usually made with a baguette type of bread, topped with some kind of meat (chicken, pork, etc), fresh vegetables (pickled carrots, cilantro, etc), and some kind of sauce. Xe May is a very small shop, so it’s only good for a quick power lunch or if you’re buying to go. Not a good place if you’re planning to have a big group meal. 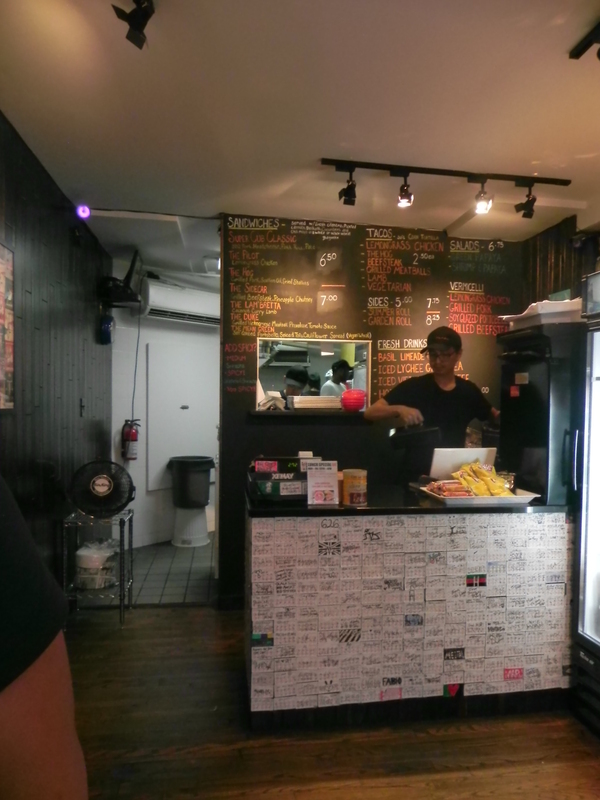 Here is the menu, featuring their sandwiches, salads, tacos, and even a lunch special with a drink and snack. I think these are the best Vietnamese sandwiches I have ever had to this date. Sooo…. I’ve been wanting to go to this sandwich place since like last year. Every time we visit St. Marks, I’m asking Pinky “Can we finally stop by Xe May?” and she would say “maybe next time, we’re full”…. LOL. So the day finally came…. we went and it was good. Just to let you know, this place is very small. There are probably only about 4 seats here, so you will most likely be grabbing it to go, which is perfectly fine. Fortunately for us, no one else was there when we were eating. I really like the vibe here and the workers seem so chill. 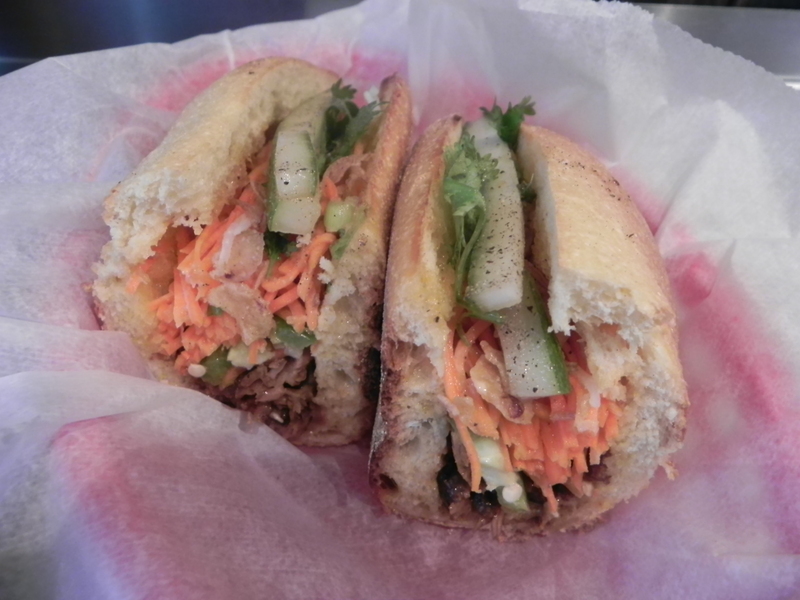 Now that you guys know what a Banh Mi is… you can try it here! It’s relatively cheap, but actually expensive if you compare it to other Vietnamese sandwich places around New York City. A sandwich here is about 6 to 7 bucks, which is not bad for Manhattan. It’s filling and delicious, but most of all, flavorful. What makes this sandwich a step above the rest is its unique flavors. Pinky and I shared the “Hog.” Aside from their included ingredients, The “Hog” consists of grilled pork, scallion oil, and fried shallots. The chili mayo is also a wonderful addition to this sandwich and I think it is actually one of the major things that make this Vietnamese sandwich shop stand out above the rest. The baguette was absolutely crispy and toasted perfectly. I felt like it was a perfect combination of ingredients. Of course I wanted to order another sandwich, but I will save it for next time! Will definitely be back here in the future to try the other sandwiches! We also shared an ice Vietnamese coffee. I thought it was pretty good, a tad bit sweet for me. Unlike Pinky, I am not a coffee addict/ professional. You can ask her how it was. So if you’re around the area and wanna grab something quick to go, I would highly recommend this place if you just want sandwich for a good price. I’m personally not that much of a sandwich fan, but I would definitely recommend a good refreshing viet sandwich now and then. The shop is cute and it reminds me of those informal street vendors in Asia. The baguette part of the sandwich was very crispy and crunchy and the pork was seasoned perfectly. I wish it was a bit spicier though. I thought we would have a special sauce when we asked for more spicy, but it was just jalapeno. No fouls there though. I’m usually also not one to like cilantro or those minty strong herbs. However, I don’t know why I only like it when it’s in a Vietnamese sandwich…they really know how to marry flavors together. I also liked the kick of flavor from the chili mayo. I think this is the first viet sandwich I had with chili mayo! It was very filling too. I only had half of the sandwich and I was stuffed. 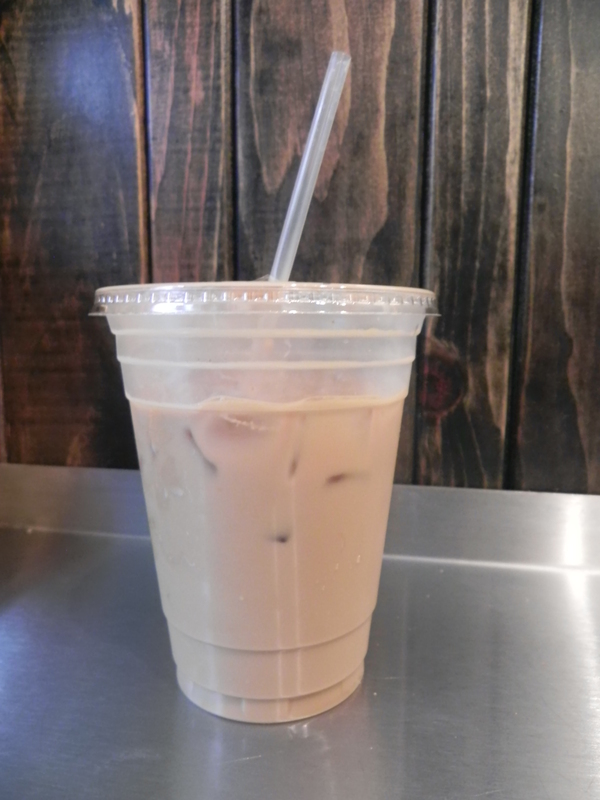 The iced coffee for $2.50 is a pretty good deal, considering it’s not watered down — but it doesn’t really taste like the real Vietnamese coffee, simply coffee that I could get anywhere else. The place is really easy to miss if you’re not looking for it so be sure to look out for it and go give it a try. Posted on August 12, 2013 August 12, 2013 by pinkytwinkieeePosted in manhattan, New YorkTagged astor place, banh mi, coffee, crispy, crunchy, delicious, east village, food, fresh, garlic, iced coffee, little, lunch, pickled vegetables, power lunch, sandwiches, shallot, shop, st. marks, viet, vietnamese. Previous Previous post: Hey, It’s Jurassic Park?